Background: Inadequate postoperative pain management could lead to persistent pain and this is, in part, due to incomplete understanding of the mechanism of postoperative pain. Currently available rodent models may have limited translatability to clinical postoperative pain. Thus, a preclinical model of postoperative pain was developed in the cynomolgus macaque, a species that is phylogenetically closer to humans than rodents. Method: The presence of pressure hypersensitivity was assessed with non-noxious pressure applied proximally and distally (approximately 10 cm) to an abdominal incision in macaques. The effect of the opioid morphine (intramuscular, i.m. ), the nonsteroidal anti-inflammatory drug diclofenac (i.m.) and the anticonvulsant pregabalin (i.m.) on pressure hypersensitivity was evaluated one and two days following surgery. 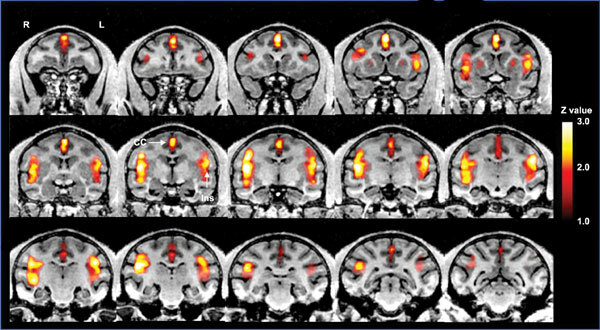 Brain activation during non-noxious pressure stimulation was observed with functional magnetic resonance imaging. Results: Hypersensitivity to non-noxious pressure applied proximally and distally (approximately 10 cm) to the incision was observed, lasting for up to seven days and three days, respectively, following surgery. Postoperative pressure hypersensitivity was attenuated with morphine but not with either diclofenac or pregabalin. Bilateral activation of the insular cortex and cingulate cortex was observed during non-noxious pressure stimulation proximal to the incision, which was attenuated with morphine. By contrast, pregabalin reduced only cingulate cortex activation. Conclusion: The lack of antinociceptive efficacy of pregabalin on postoperative pain could be due to the incomplete suppression of pressure-evoked brain activation. It is speculated that incomplete postoperative pain relief observed in general could be due to residual or persistent activity of key pain nuclei such as the insular cortex. The current macaque model could be used for further elaborating the mechanism of postoperative pain as well as confirming the efficacy of potential treatments for the management of postoperative pain. Pressure hyperalgesia, functional magnetic resonance imaging, primary hyperalgesia, translational preclinical model, insula, cingulate.